John Whittlesey Salvia (s. darcyi x microphylla 'john whittlesey') - Beautiful hybrid salvia hummingbirds can't resist. 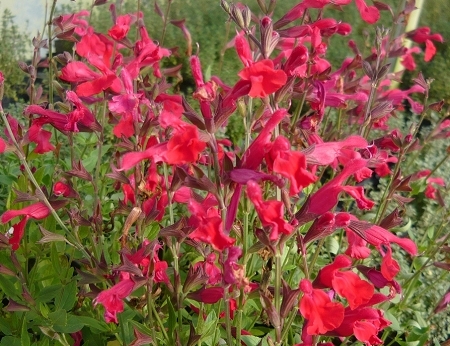 A real standout, this salvia is known for it's continous and long bloom period and large red flowers. Drought tolerant and deer resistant. Named after plantsman John Whittlesey. You will be glad you planted it! Perennial zones 7-9. Live plant in 3" container.